Managing director Chris Anderson says it is "highly unlikely" that Coventry City will sign any more players on loan after adding more than their full complement at the Ricoh Arena. Rules state that clubs can have only five loan players in a match-day squad, and Tony Mowbray's side now have six following a busy transfer deadline day. "I think it's highly unlikely we'll bring in more loans," said Anderson. But he has not ruled out bringing in free agents to the League One club. He told BBC Coventry & Warwickshire: "What it also does open up is the possibility of some players who are currently without an attachment to come into the football club as permanent signings." 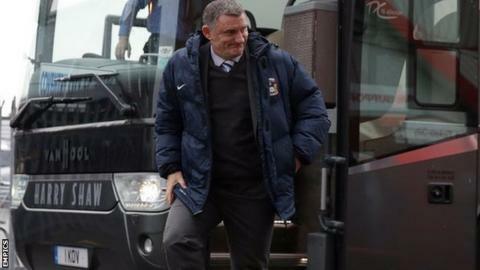 Mowbray's faltering City lie fifth in League One, having won just twice in 11 matches. They have drawn five of those games, but of their four defeats, the last three have come in successive matches. With top scorer Adam Armstrong and fellow Newcastle United man Gael Bigirimana and Norwich City striker Jacob Murphy already on loan at the Ricoh Arena, City reached their five-man quota when they made two defensive loan signings late on Monday. Southampton's Jack Stephens was followed in by another young defender at a Premier League club, Bournemouth's Baily Cargill. The Sky Blues sold midfielder James Maddison to Norwich for a sizeable, escalating seven-figure fee, then had him loaned back. That brought their total of current loan players to six, one of whom will have to be left out of the squad by Mowbray for each match.